Those who have ever experienced (or are currently experiencing) homelessness know how difficult it can be to pick yourself up off the mat. Since 1911, the Erie City Mission has worked diligently to give those feeling down for the count a puncher's chance. With ministries serving men, women, and youth, the resilient non-profit fights daily for the city's less fortunate. 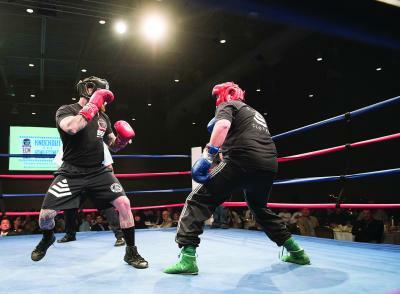 Once a year, community leaders put their gloves on (literally) to join the fray at the ECM's Knockout Homelessness Fundraiser. To help those struggling to find their way back into the societal arena, these brave men go toe-to-toe in the ring against bona fide boxers to raise both money and awareness for the Erie City Mission's campaign. "This event has been a major success since its beginnings in 2008 … Over the last 11 years, Knockout Homelessness has raised well over $500,000 for the Erie City Mission's Men's Emergency Shelter," says Autumn Schubert, development associate with the City Mission. Round 12 of the event is headlined by Erie Mayor Joe Schember going up against local boxing legend Lou Bizzarro, Sr. in what is being billed as "the greatest rematch of all-time." Joining them on the card are Elevate Church lead pastor Colby Atkins, who attempt to bring the holy rain down on the junior Lou Bizzarro, and Level Red Boxing Vice President Matt Pribonic, who will test his fitness and business acumen against another veteran in "John Boy" Bizzarro.